Yeah, it's real. I wish I could find my list of what was there. Standouts: The '57 Testarossa in the front right, Schumacher's '97 F1 car, Tazio Nuvolari's 1935 Alfa P3, the 275 GTB-4 NART Spyder, the 300SL Gullwing, the Fiat Ferrari transporter, the Lotus 18, hell, the whole place. Moto44, is it just me or do we have some parrallels here? Btw, this is what I have done in the last week as we just moved here. My first garage in 2 decades! Welcome to the Man Zone as my wife calls it. Btw, ignore the garbage and stuff next to the bikes. That was all going out tonight. Got used to apartment living and 365 day a year dumpsters at the ready. OK. Technically, it is a garage and I took the picture, so it's personal...and there are a few Elans on the left-hand side of the photo...Andy's photo inspired me. Well, compared to Qball's, my little 1 car garage is the size of a broom closet. BUT, it's carpeted! Posted before, but what the heck. It's crazy what's tucked away in warehouses up here. I know of at least ten world class collections in the area that deserve to be in a book somewhere. From some photos I've seen of track days at PIR, he seems to be quite the track junkie with his collection as well. I wish more of these collectors would put up galleries or sites or something, even anonymously, as some are our true custodians of automotive and racing history. Yeah, all of the guys that I have met have been very excited to share their collections and talk at length about the cars. It's not like they're hoarding them. I think they just tend to be so busy that a well organized site would have to be a 'maybe later' project. Looking at Jon Shirley's collection (the Ferraris above), he actually tracks or races just about all of the cars, including the ex-Schumacher F1 car! He doesn't baby them. I love that. While I went on vacation, I got four cars to fit in my two car garage. Glad to "hear" from you, Moto44. Your Elise has been a most welcome addition to my garage. No photos, though - my garage can't compare to yours. 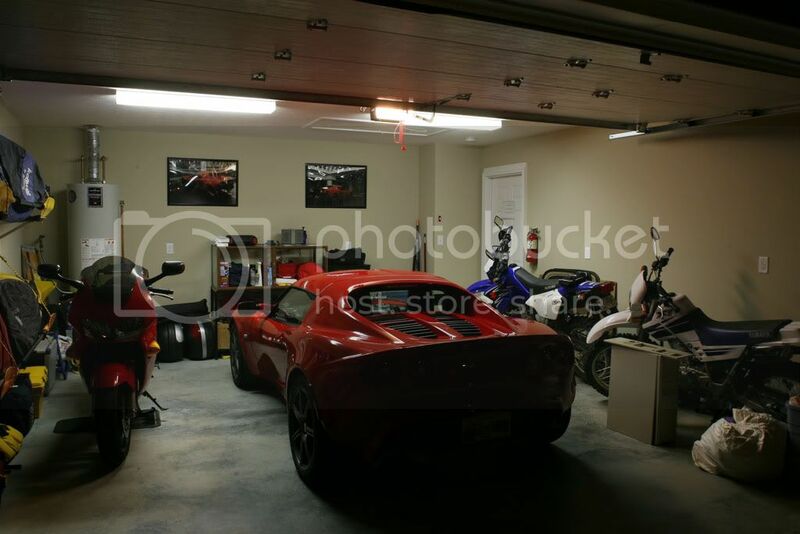 My garage isn't nearly as interesting without the Elise parked in it. I have been very pleased to see that you have been enjoying it! OMG!! Todd...you got your floor dirty!!!!!!! I still sweep it once a day. I sweep mine once a year whether it needs it or not! I have been very pleased to see that you have been enjoying it! 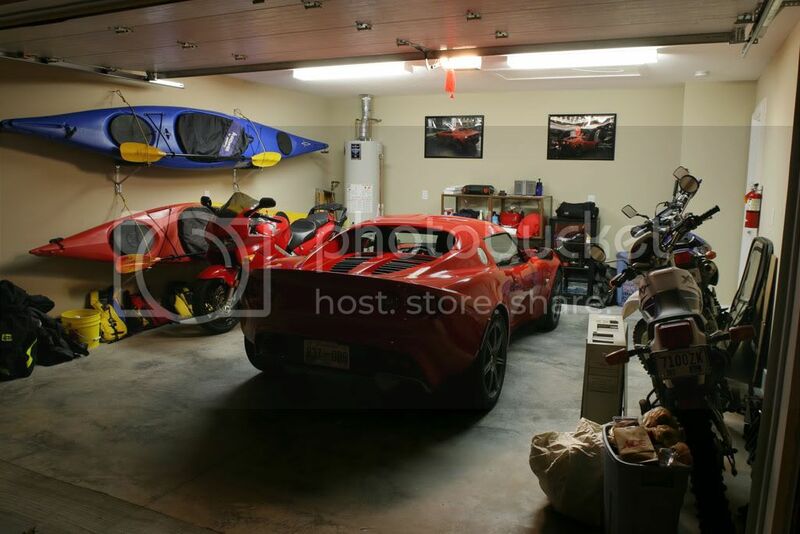 Todd, your Elise does have its own bay with enough room that I can play a tiny bit at learning how to work on cars. I've put 6000 miles on it since September. Thanks for being the source of the most fun I've had, aside from raising my daughters, since I discovered girls in junior high. My garage in Winnetka CA. The Lotus is in the one car.